My garden is as full of mistakes as it is of plants. When I’m feeling extra critical or envious of picture-perfect gardens in magazines I see all of the stupid ideas, misplaced plants, egregious wonkiness, and weeds. And then I pick at every error I’ve made through the years like a scab. My first mistake was to start planting immediately. Every gardener (including me) will tell you to wait at least one year before adding anything or making major changes to a new property. We all agree it’s important to learn the lay of the land; where the sun shines as it arcs through the seasons, where the rain collects and doesn’t. Could I wait a single minute after signing the papers for this patch of earth? Nope. We gardeners are a patient bunch—we love to watch things grow—but I can’t imagine any of us being able to resist the urge to plant as soon as we have the chance. Because they also say it takes at least twelve years for a garden to come into its own. (“They” being those gardeners who have tended the same plot for twenty years or more.) Please. My garden is almost two-thirds of the way through its twelve year sentence and I still can’t wait that long. But now, long since making the mistake of haste, I can see the virtue in thinking before digging. Not only do I wish I had spent more time planning my garden before filling it to the gills but sometimes I kick myself for not springing for a consultation with a professional designer. Someone with an eye for gracious spaces who might have preempted my inclinations for tall plants near entries, and narrow pathways. Sticking to a plant list matching my garden’s specific cultural conditions and space considerations would have been a good idea too. My biggest challenge lies in falling in love with almost every plant that passes in front of my eyes or nose, and in being incapable of refusing friends’ generosity. Without a proper plan and list, it has been impossible not to break the cardinal rule of gardening: Plant the Right Plant in the Right Place. I have planted a lot of those gifts—right plants every one—in wrong places. Not a big deal when it comes to perennials that manage to survive long enough for me to replant them as appropriate spots become available, but more of a problem with trees and shrubs. Far too many of those have either outgrown their wrong place and clogged the path or failed to thrive in conditions not conducive to health and happiness. As my garden grows, I’m getting better at saying, “No, thank you” to offers of plants I didn’t know I wanted. That said, every impulsively placed plant has taught me something new about my garden; every edit, transplant, eviction, and untimely death has shown me where there’s room for improvement. Mistakes are great that way. 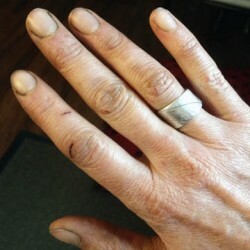 I pick at their scabs not because I want to beat myself up for being a lousy designer, but because it’s the mistakes, more than the successes, that make the garden interesting, and keep it changing and coming into its own, week to week and year by year. Stay tuned. 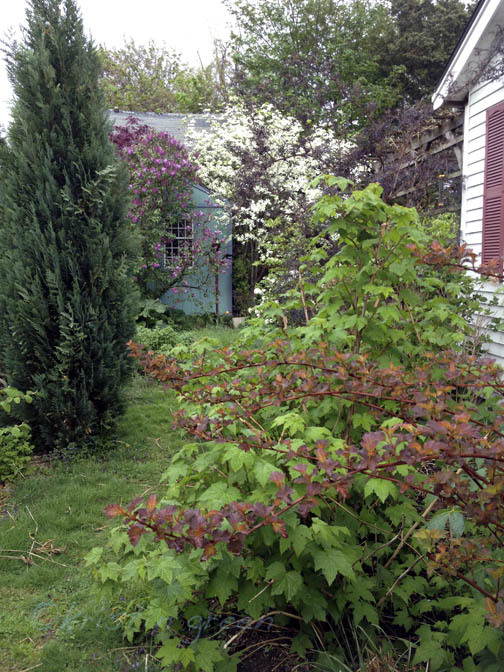 Z and I just removed a stupidly sited flowering raspberry (Rubus odorous — the leafy green bramble on the right in the above pic). Not only did it crowd the path and bug Z every time he tried to mow (Literally. He kept being stung by its bees.) but it occupied the perfect location for a gifted Hinoki cypress we need move to make way for a house project. Incidentally, I transplanted a few of the raspberry’s suckers into the back border where another gifted evergreen, a cryptomeria this time, suddenly recently failed to thrive. What do you learn from your mistakes? Or do you get it right the first time? This is interesting. I am in the slow gardening camp as I cannot conceive how people can make things look good really fast. I’ve been working here for years and it is only now just beginning to pay off. Especially with shrubs. People should think of shrubs and trees in human-time, like, it’s going to take 20 years for something to look good. This is an analogy I use to explain to people why they shouldn’t plant tress that will shoot up quickly. Would you expect your kid to be 6 feet tall in 10 years? It would cause huge physiological problems for your kid, and so it is with trees. Same for desert plants, if not more so, but in a way worse. Learning from your mistakes….Amen! And yes, sometimes these spur of the moment plantings turn out to be the most imaginative ways to use plants. I say it takes courage to break the rules. A garden always evolves with the hand of the gardener don’t you think? I have learned so much more from my mistakes than from those really successful plantings. I don’t worry about it, I just move it. Playing in the dirt is such fun!